Bonjour mon ami! Enjoy a trek over the spectacular Esplanade Riel Pedestrian Bridge across from The Forks and you’ll find yourself in St. Boniface, founded in 1818 by Bishop Provencher for the colony’s French and Métis residents. It is also the birthplace of Louis Riel, the Métis leader who helped create of the province of Manitoba. Now it is home to one of the largest francophone communities west of the Great Lakes, and it is the heart of Manitoba's French history and culture. While here, you can stroll along le boulevard Provencher and visit boutiques and quaint cafés along the way. You can also enjoy walking tours where you will view more than 35 designated historical sites in this culturally-rich area and end the day with some scrumptious French pastries. Gaining buzz in the French Quarter is Marion Street Eatery, which serves stylized comfort food for breakfast and lunch. Other notable eateries include: Resto Gare, where authentic French cuisine is served aboard a refurbished train car; Promenade Café and Wine with gorgeous views of The Forks and the downtown skyline; and Le Garage Café, which is constantly packed with live music lovers and is renown as one of the best poutines in the city. Francophone bookworms can head to À la Page for the largest selection of French books in the city, while chocolate lovers can satisfy a sweet-tooth at Chocolatier Constance Popp with artisan bon bons, bars, truffles, and more. Their chocolates make fantastic takeaway treats to give as gifts… if you can stop yourself from eating them first. 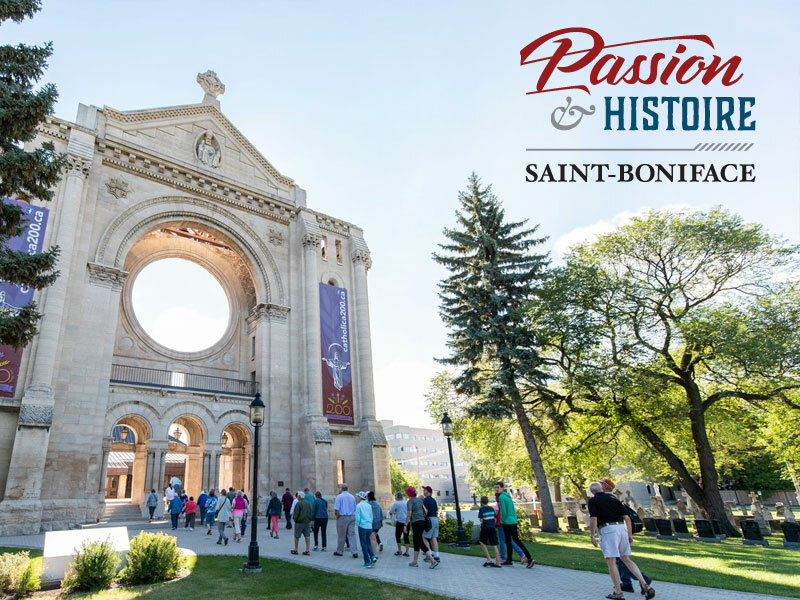 One of the city’s major architectural landmarks, Cathédrale de Saint-Boniface, attracts thousands of visitors each year. The current cathedral is the sixth church to be built on this site since 1818. It incorporates the facade and remaining walls of the 1908 building, which was destroyed by fire in 1968. Journey back in time to the fur-trade era with a visit to Fort Gibraltar. The fort is a reproduction of the original fur trade post built by the North-West Company around 1810. In summer, costumed interpreters guide visitors through this historical site, while in February it is part of the 10-day festivities of Festival du Voyageur, Western Canada’s largest winter festival. Down the street, you will find Winnipeg’s oldest building, an oak-log structure originally used as the Grey Nuns’ Convent, which currently houses the Le Musée de Saint-Boniface Museum. An impressive collection of artifacts and displays in French and English explain the history of French-Canadian and Métis communities in Western Canada. A special exhibit is dedicated to Louis Riel, the “father” of Manitoba. St. Boniface City Hall is a three-story, red brick building was home to St. Boniface’s civic government for nearly 70 years, prior to its amalgamation with Winnipeg in 1972. Inside, the Riel Tourism bureau offers information for attractions and events throughout St. Boniface. For those looking for some outdoor activities, St. Boniface Golf Club is a gorgeous 18-hole semi-private course nestled in the neighbourhood along the banks of the Seine River. Next door is Windsor Park Golf Course and the Windsor Park Nordic Centre, which offers cross-country ski rentals and lighted night trails in the winter months. To learn more about the passion & histoire of this neighbourhood, click here.